Toolazine What Do You Use a Table Saw For? What Do You Use a Table Saw For? A table saw is an impressive tool. It consists of a circular saw blade and a flat surface. There are guide bars for sliding wood and other materials through the blade. The purpose of the blade is to cut. Here’s 10 ways a table saw can be used. The main use of a table saw is cutting flat pieces of wood. This includes rectangular boards and rectangular blocks. You could cut a square-shaped piece of wood as well. There are many applications for flat pieces of wood. Wood boards are used to make door panels, shelves, cabinets, tables, and desks. All you need to do to make these items is cut wood with a table saw. Another use of a table saw is cutting tree trunks and logs into smaller pieces. A very long tree trunk could be cut into dozens of smaller logs, each of which could fit in a fireplace. With a stack of small logs ready for the winter, you won’t have to collect new wood for the fireplace. Investing in a table saw is a good idea, especially if you live in rural areas. Wood is abundant there, and it is essential to everyday life. Here’s a guide to the best portable table saws, these are cheaper than the best hybrid table saw or a cabinet table saw. Carving wood by hand isn’t easy. The process could be very tiring and time-consuming. One way to carve lines and canals into wood easily is by using a table saw. Simply set the height of the table saw blade to the desired depth of the lines and canals. Then, slide the wood into the saw. In just seconds, the table saw will produce perfect lines and canals in the wood. If flat edges are too ordinary for your designs, consider cutting angled edges. With a table saw, this is possible. Place the circular saw blade at an angle. Then, slide a piece of wood through the saw. The cut will be slanted, creating a slanted edge. This can be used in several projects. For example, you could make a slanted drawer panel for a chest of drawers without handles. It is opened by pulling on the slanted edge of the drawer. Another clever design is angled pieces of wood. This is different than slanted edges. A piece of wood cut at an angle is shaped like a trapezoid. This can be used as wall shelves. Mounting wood of this shape on a wall is stylish. Trapezoid-shaped wood panels are interesting as well. These can be incorporated into cabinets. To cut angled pieces of wood, turn the wood before sliding it through the circular saw. If your project requires plastic, use a table saw to cut pieces of plastic. One form of plastic is sheets. Slide the sheet of plastic through the circular saw to cut it. An innovative application is 3D projection. With a small piece of plastic, shaped into the right form and placed on a smartphone, a hologram can be created. Aluminum can be used to create a lot of things. One way to get useable aluminum is by cutting large sheets of aluminum with a table saw. With the smaller pieces, you can make aluminum jewelry, art, and boxes. Aluminum cans can be used to create lots of things. But first, you have to get to the usable parts of the can. Another consideration is demand. If you have orders to make lots of aluminum-based items, use a table saw to cut hundreds, even thousands of cans rapidly. When enough cut-cans are ready, start assembling the products. Aluminum cans can be used to create cookie cutters, bracelets, tin flowers, candle holders, and pencil holders. Another use of a table saw is cutting strips of brass. Strips of brass can be used for decorative purposes. Nail or screw a strip of brass on desktops or countertops. It can also be used in carpentry as room dividers or separators, based on floor materials. For example, a room with carpet and a room with vinyl floors could be divided by a strip of brass. The same is true for a room with wood floors and a room with carpet. One more use of a table saw is cutting metal rods. Thin pieces of cylindrical, metal rods can be used in many applications. For example, a thin metal rod could be used to support growing plants. Another use is mixing or stirring cups of liquids. A sharpened rod could be used as a spear. Larger metal rods can be used to build a fence. Table saws are built to last. They are sturdy, stable cutting machines that are useful to professionals and the every-day homeowner. There are more uses and advantages of a table saw than there are listed here. 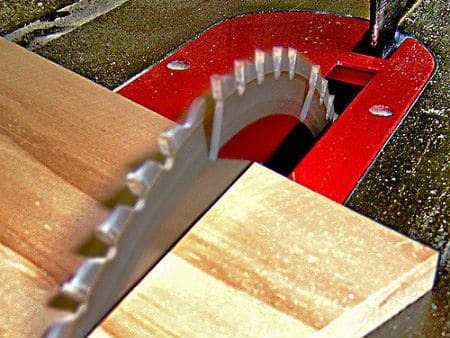 This list can be considered a basic introduction to the science of table saw cutting.